The Hitman's Bodyguard did well at the box office this summer but at the same time, it was one of the most pirated films. The filmmakers were obviously not happy with this development so in a counter-attack, they are now sending out automated $300 fines. 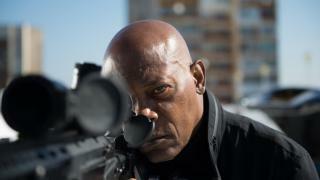 Late August a ‘piracy disaster‘ struck the makers of The Hitman’s Bodyguard, an action comedy movie featuring Hollywood stars Samuel L. Jackson and Ryan Reynolds. The film was leading the box office charts when, eight days after its theatrical release, a high definition copy hit various pirate sites. While it’s hard to predict whether the leak substantially impacted the movie’s revenue, the people behind the film are determined to claim damages. They hired the services of “Rights Enforcement,” an outfit which tracks down BitTorrent pirates. Rights Enforcement sends automated ‘fines’ via DMCA notices, which is cheaper than expensive lawsuits. At the same time, this also makes the settlement process easier to scale, as they can send out tens of thousands of ‘fines’ at once with limited resources, without any oversight from a court. TorrentFreak has seen several notices targeted at The Hitman’s Bodyguard pirates. While the notices themselves don’t list the settlement fee, recipients are referred to a page that does. Those who admit guilt are asked to pay a $300 settlement fee. “We have evidence that someone using your Internet service has placed a media file that contains the protected content for our client’s motion picture in a shared folder location and is enabling others to download copies of this content,” the notices warn. The text, which is forwarded by several ISPs, is cleverly worded. The account holders in question are notified that if the issue isn’t resolved, they may face a lawsuit. 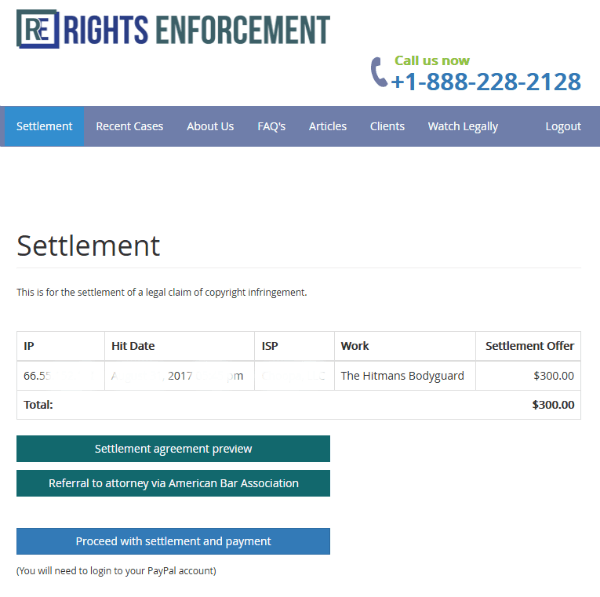 The email points users to the settlement portal where they can review the claim and a possible solution. In this case, “resolving” the matter will set account holders back a hefty $300. People are free to ignore the claim, of course, but Rights Enforcement warns that if the infringements continue they might eventually be sued. The notice also kindly mentions that the recipients can contact an attorney for legal advice. However, after an hour or two a legal bill will have exceeded the proposed settlement amount, so for many this isn’t really an option. It’s quite a clever scheme. Although most people probably won’t be sued for ignoring a notice, there’s always the possibility that they will. Especially since Rights Enforcement is linked to some of the most prolific copyright trolls. The company, which emerged earlier this year, is operated by lawyer Carl Crowell who is known for his work with movie studios such as Voltage Pictures. In the past, he filed lawsuits for several films such as Dallas Buyers Club and The Hurt Locker. When faced with a threat of an expensive lawsuit, even innocent subscribers may be inclined to pay the settlement. They should be warned, however, once the first payment is made, many similar requests may follow.